Scientists at the University of Plymouth are teaming up with colleagues in Saudi Arabia to try and identify ways to help the country reduce its reliance on crop imports. Academics in the School of Biological and Marine Sciences have signed a memorandum of understanding with the University of Jeddah to explore joint projects that would allow plants to be grown in controlled conditions in the Middle East. The link has been partly facilitated through a grant from the British Council, and will aim to replicate a project at the University, Plant Factory Cornwall. Funded through Agri-Tech Cornwall, Plant Factory Cornwall aims to use artificial lighting powered by solar energy to create the best possible conditions for fruit and vegetables to flourish. Based within a multi-tier production unit, its LED lights can be individually programmed to change lighting within the unit and give a precise light recipe for each species. 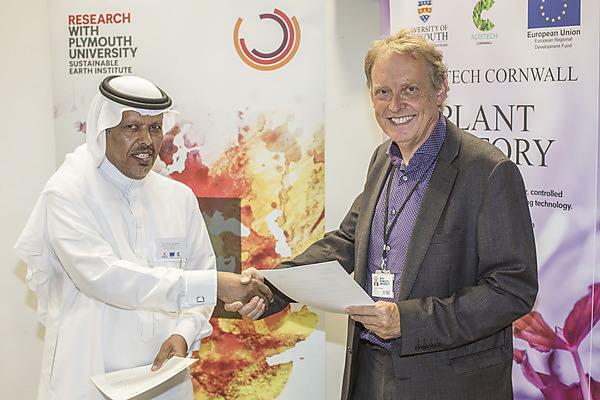 Scientists from the University of Jeddah attended the launch of that initiative in Plymouth, and are now beginning to examine the potential for it to be replicated in the Saudi Arabia.